Stephen Curry is at 399 3-pointers, and the Golden State Warriors are well on their way to 73 wins. Golden State leads Memphis 70-50 at the half, moving closer to becoming the first team to go 73-9 in NBA history. 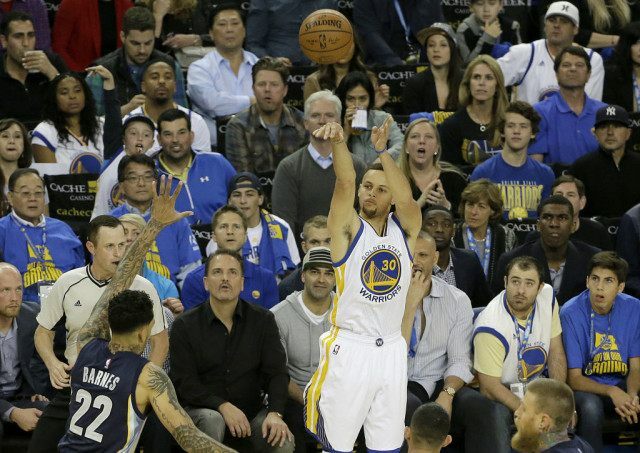 Curry has 25 points, fueled by seven 3-pointers — putting him within one of 400 for the season. Stephen Curry and Kobe Bryant are getting hot. Curry is off to a flying start, as Golden State chases a record 73 wins and he chases 400 3-pointers in a season. Curry had 20 points in the first quarter, going 6 for 9 from 3-point range as Oracle Arena was absolutely roaring in delight and Golden State ran out to a quick 37-23 lead over Memphis. Meanwhile, 350 miles or so south in Los Angeles, Bryant made five consecutive shots after a slow start to his final game. Bryant also shot the 10,000th free throw of his regular-season career, the first non-post player to shoot that many. Bryant had 15 of the Lakers’ 19 first-quarter points, and Utah took a two-point lead into the second period there. The six early 3’s gave Curry — already the NBA’s single-season record holder by a whopping margin — 398 hits from beyond the arc this season. Coming into this season, his record was 286 3’s. The reigning MVP said last week that if he gets to 399 3-pointers, he’s likely to “chuck it” to try and reach 400. Golden State’s game with Memphis, and the Los Angeles Lakers’ game with Utah are both finally underway. The Warriors tipped off a few minutes before the Lakers did, in part because of all the tributes for Kobe Bryant during the pregame festivities in Los Angeles. Bryant missed his first three shots, including one on the first Lakers’ possession. Kobe Bryant is all smiles going into his final game. His eyes were locked on the video screens at Staples Center as longtime opposing players, former teammates and coaches paid tribute to Bryant with a video montage. Bryant particularly beamed when Pau Gasol and Lamar Odom offered him kind words on the tape. “You’ve become the ambassador of basketball,” his former Lakers coach Phil Jackson said in the video, which also included comments from actor Jack Nicholson — perhaps the best-known of all the celebrity fans at Laker games. Nicholson joked that he might retire along with Bryant. When the video ended, Bryant embraced Magic Johnson, then saluted the crowd with claps and a wave. Bryant then returned to the bench, gave trainer Gary Vitti — also retiring — a huge hug, then wrapped his arms around coach Byron Scott before returning to the court to resume warming up for the final time. The Eastern Conference playoff field is set. Miami has the No. 3 seed — despite an epic collapse in Boston — and will play No. 6 Charlotte in the first round. No. 4 Atlanta will play No. 5 Boston. The other two East matchups were set Tuesday: No. 1 Cleveland vs. No. 8 Detroit, and No. 2 Toronto vs. No. 7 Indiana. Tonight, the Warriors are going for 73 wins. After that, they’ll be going after the Houston Rockets. The 16th and final available berth in the NBA playoffs belongs to the Rockets, who clinched it by blowing out the Sacramento Kings on Wednesday night — that game ending not long before Golden State played host to Memphis in their regular-season finale. Lakers coach Byron Scott knows how many minutes he wants to play Kobe Bryant in the superstar’s final game, and he knows how he wants Bryant to leave the court for the final time. He isn’t sharing those plans with anybody but Kobe and his staff. Scott and Bryant embraced briefly after Kobe arrived in the Staples Center locker room. The moment is bittersweet for Scott, whose two dismal seasons as the Lakers’ coach have been leavened by Bryant’s presence. Steve Kerr is sporting Scottie Pippen socks as Golden State goes for win No. 73. That’s the way Kerr is honoring that 1995-96 Bulls team that won 72 games. The Warriors coach received an email a couple of days back from Phil Jackson, who coached that recordsetting Bulls team, and he has seen the thoughtful tweets from former teammates like Pippen and Ron Harper. Any differences with his likable Warriors led by Stephen Curry and Michael Jordan’s Bulls back in the day? “Michael was beloved, but nobody could actually be like Mike,” Kerr quipped. Dallas Mavericks owner Mark Cuban is a big Kobe Bryant fan — now that he’s retiring. Cuban had nothing but the highest of praise for Bryant on Wednesday night, before the Lakers’ star would play in an NBA game for the final time. Cuban said that as a competitor Bryant ranks among the best on his list, which also includes the likes of Dirk Nowitzki and Michael Jordan. Cuban knows the Bryant highlight reels will be playing for some time, and he hopes to see one play in particular in those packages. There was a Lakers-Mavs game about a decade ago where, with the shot clock running down, Bryant connected on a turnaround 3-pointer from the corner — shooting it with his left hand. Cuban rose from his seat in applause for that one, and still speaks of it fondly. “Best Kobe play I’ve ever seen,” Cuban said. Fans have been gathering by the thousands outside Staples Center all afternoon, and the Lakers have closed down Chick Hearn Court to throw a street fair in honor of Kobe Bryant’s retirement game. Fans in the pricey courtside seats are getting a gift bag filled with a hat, a shirt and other gear, along with a limited-edition, individually numbered action figure of a “RoboJam” Kobe. It appears to be a half-man, half-cyborg version of the Lakers’ career scoring leader. Kobe Bryant is in the building. The third-leading scorer in NBA history arrived at Staples Center for his final game in a black suit, black shirt and black tie. He smiled, waved and shook hands during the walk through a cordon of media members and other guests on the way to the Lakers’ locker room. “Let’s have some fun!” he said along the way. Bulls radio commentator Bill Wennington, who played on Chicago’s 72-win team, is pulling for Memphis when the Grizzlies take on Golden State. For Wennington, a Warriors win would be a Bulls’ loss. “I don’t want them to do it,” Wennington said. “But if they do it, it’s fantastic. It’s hard. I know exactly what they’ve done, how hard they’ve had to focus and play all year. Whether the Warriors set the NBA record for wins in a regular season, Bucks coach Jason Kidd says they’ve already answered one question that was raised when the Bulls won 72 games in 1995-96. “It’s interesting that when that Chicago Bulls team did that, there was a lot of discussion, could an Eastern Conference team or a Western Conference team, a team based on the coast, be able to break that record. Heat coach Erik Spoelstra plans to catch some of the Lakers game on TV Wednesday night so he can watch Kobe Bryant cap off his career. “Look, we’re all basketball fans,” Spoelstra said before the Heat played the Hornets, which will start about 2 ½ hours before the Lakers tip off against the Jazz. “He was only able to play a few minutes in our last game. But we’ve been in some epic battles with him. Hornets coach Steve Clifford says what impresses him the most about the Warriors this season is how dominant they have been. “They don’t even have close games when they play well,” Clifford says. “In my time, San Antonio has been the franchise, but even in their best years they had close games. When (the Warriors) play well, it’s not even close. They are overpowering. Suns interim coach and longtime NBA player Earl Watson has mixed emotions about the Warriors possibly breaking the Bulls regular season mark. “Golden State has a chance to break a great record that we all grew up witnessing,” Watson said Wednesday. “It’s kind of bittersweet because for us in our generation growing up watching the Bulls and Michael Jordan. That was to us the greatest team ever. Watson, who played against Bryant, said to appreciate him you have to look past the numbers. “We will see other skill guys who will be compared to Kobe but it’s going to be very difficult to see another guy have his mindset,” Watson said. “A lot of these young players don’t realize it’s not scoring the points or how you score the point, it’s the way he did it mentally. It’s the sacrifice he made in the offseason for his body. Golden State guard Klay Thompson seems fine if the Warriors’ are playing second fiddle to Kobe Bryant’s farewell night, which just happens to coincide with Thompson’s team trying to become the first 73-win team in NBA regular-season history. “You might not ever see this opportunity ever again,” Thompson said. Everyone is gearing up for the big night in Oakland, including a trio of select high school students. Draymond Green got an idea to provide three Oakland-area high school students with top GPAs tickets for them and a guest Wednesday night. The students who earned tickets for the big game are Dyllon Louis, McClymonds High; Travon Hadnot, Dewey Academy; and Joseph Martin, Coliseum College Prep. Green chose high school students because he believes they will remember the special night. For those who can’t get tickets, the game should be well documented. The Warriors have granted about 350 media credentials, comparable to last year’s Western Conference Finals. A typical game draws 60-70, the team says. Kobe Bryant is the subject of a new Nike video, in which he plays the role of a conductor and turns the cries of his “haters” into song. Nike has put out three videos in recent days connected to Bryant’s farewell. The first, “Don’t Love Me. Hate Me,” has Bryant speaking about reasons to love and hate him. Another followed with a number of Nike athletes, including LeBron James, Serena Williams, Roger Federer, Tiger Woods, Rob Gronkowski and Kevin Durant sharing memories about Bryant. Warriors coach Steve Kerr is at Golden State’s shootaround ahead of the defending champs’ record-chasing final regular-season game against Memphis on Wednesday night at Oracle Arena in Oakland, California. Kerr was sidelined for the season’s first 43 games while dealing with complications from two offseason back surgeries. He missed Tuesday’s practice for a doctor’s appointment. The big night has arrived. Golden State going for 73 wins, and Kobe Bryant going into retirement. The 170th and final day of this NBA regular season will be loaded with intrigue, maybe an unprecedented amount. Golden State plays host to Memphis later Wednesday night, and a win would give the Warriors outright possession of the best record in league history. Golden State takes a 72-9 record into the finale. At worst, the Warriors will match Chicago’s record of 72-10 set in the 1995-96 season. Meanwhile, Bryant’s final game of his 20-year career with the Los Angeles Lakers is also generating an enormous about of attention. Bryant will retire as the NBA’s No. 3 all-time scorer, his finale coming when the Lakers play host to the Utah Jazz later Wednesday.